Please refer to our stock # 3156 when inquiring. 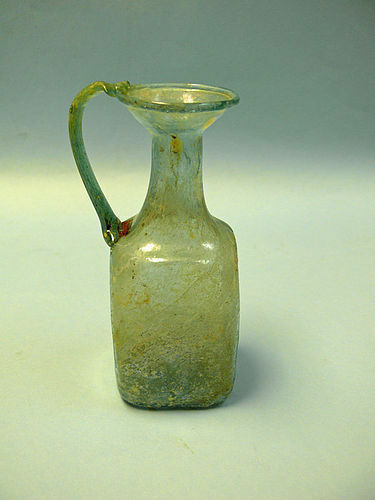 Byzantine / Early Chjristian Green Glass Juglet, ca 6th - 7th Century CE. Mould-blown with square body, cylindrical neck, and funnel shaped rim. Sides are decorated as follows: a) Shrine with triangular gable and hanging lamp. b) vertical Tabula Ansata with net pattern. c) Shrine with triangular gable and hanging lamp. d) Net pattern. Ex: Gershon Bineth collection, Jerusalem. (Bineth Gallery of Fine Art) Literature: Moussaieff coll., p.44. Israel Museum coll., (H) no. 452. Oppenlander coll., no. 500. Juglet handle is professionally repaired, fissure in neck is apparent as seen in images. Otherwise a magnificent specimen of early Christian glass. 5 1/2" high x 2 1/4" wide x 3" deep.